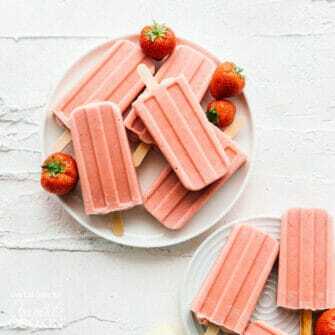 Creamsicles, also affectionately known as Dreamsicles, are orange flavored popsicles with a creamy vanilla center. They are creamy, dreamy deliciousness. In fact, one of my all time favorites is the Weight Watchers Orange Sorbet bar, holy-amazingness! So when I saw this recipe come through an email recipe group I’m on I was all over it. 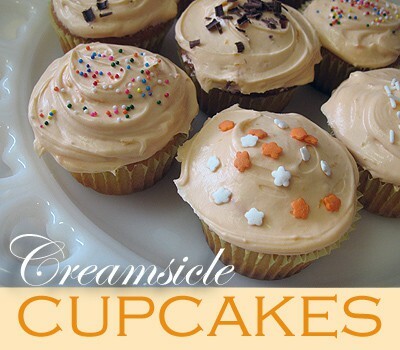 I did some googling and boy are there a lot of different Creamsicle Cupcake recipes out there! This one is pretty dang amazing, and the frosting tastes just like the ice cream bars we all know and love. I did eventually find this exact recipe on the web. No credit had been given through the recipe email group, which is common, so I ended up having to put part of the ingredient list into the search to find it. Why bother? Because I have a strong belief that you should always give credit where credit is due. Someone developed this recipe, so they should be credited for it. Just because it came nameless, doesn’t mean I (or anyone else for that matter) can claim it as my own. But I digress. The original recipe is from Woman’s Day and it’s dated March 10, 2010. I adapted mine a little and am giving it to you with my changes. These were quite popular in this house. In fact, my husband said out loud, and I quote “Man, these are good”. Might not seem like a big deal to you, but believe me, it is. :) Try them, you’ll like them! My Notes: I used vanilla sugar because I had some waiting in the cabinet. You can use regular granulated sugar as that’s what the original recipe called for anyway. Also, the frosting calls for orange paste food coloring. You can skip it as it’s for aesthetics only, I used it in mine. All you need to do is stick a toothpick in the food coloring, what comes out is all you will need. Hi Rosemary :) Use granulated sugar. I just wanted to say great recipe! I made these for bake sale recently and people really enjoyed them. I didn’t have quite enough zest so I added a bit more extract but it still turned out great I thought. 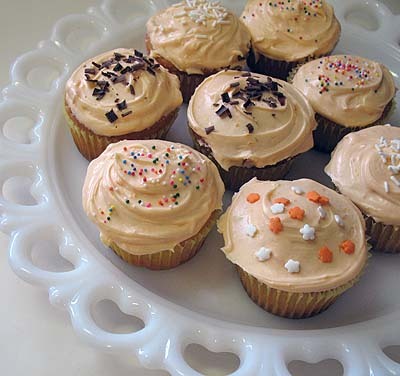 I also filled my cupcakes with orange curd and decorated with candy orange slices. The frosting was spot on, exactly like a creamsicle. I agree with others though that I had to make double the recipe to ice my cupcakes. I also thought it was a little soft, even after chilling.Either way, excellent! Hi Michelle! So glad everyone liked them! I may have to try the frosting again and see what’s up. 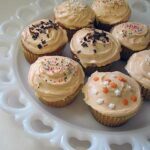 After a morning coffee discussion about creamsicles, I sent a bunch of creamsicle cupcake recipes to a member of our group and she took the one off the top (yours). She made them for her son for his birthday and brought us the excess–what a delicious morning coffee treat. I am going to try this into cakeballs for our Relay for Life fundraiser. Thank you. Ohhhh cakeballs would be marvelous with this recipe! Yum! Do you think that these cupcakes would be good with a filling? I really want to try this recipe but I also want to make a filled cupcake. Tiffani, did you try with a filling? I was looking for a recipe similar to a cupcake made at one of our local cupcake shops. It was an orange cupcake with orange cream cheese frosting, but it also had a bit of vanilla filling. I think I will try that for these cupcakes sometime. My daughter loved this recipe. She thought it was actually better than my favorite cupcake shop orange cupcake. I personally think that the frosting recipe needs to yield more, so I will likely double the frosting recipe next time.